The Belkin 7-Outlet SurgeMaster Surge Protector delivers great electronics protection by equipping users with 785 joules of energy rating, a 42,000A maximum spike current, a 5' power cord, and seven three-prong outlets to fit several key appliances, including one with a large enough radius to fit an AC block plug. The home series protects all connected equipment with a lifetime $50,000 equipment warranty. Get surge protection for all of your electronics and home appliances from a single power source; get a Belkin SurgeMaster. This surge protector gives you seven outlets with three-line AC protection. Protect your basic household electronics. In addition, one of the outlets features a large enough radius to provide room for AC block-style plugs, without covering other unused outlet. 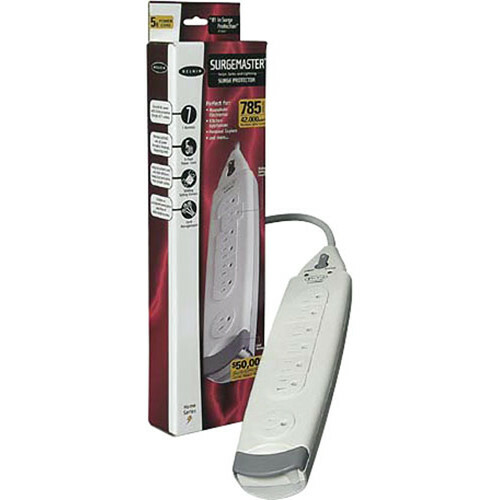 This item offers an impressive 785-joule surge protection. All your connections are given room to spike or surge without running the risk of a damaging electrical burst. The 14-gauge heavy-duty power cord is as light as a feather, yet strong as steel; this 5-foot power cord gives you added reliability. The noise filter protection filters EMI/RFI noise up to 43dB reduction. Quiet it down, but get started. This surge protector is equipped with seven sliding safety covers to protect children and the device itself. Box Dimensions (LxWxH) 16.2 x 4.7 x 2.1"